The small table on the right that “Scout” is standing on, is one example of how we can adapt a suite to suit the needs of an elderly guest .”Charloette” (in the bed) can’t jump all the way to the first level, but can jump to the table first, then the bench. We are not just pet sitters, we are trained to administer any required medications including insulin and other injections as prescribed by your Veterinarian or other health care professional. Medications are given faithfully and guests requiring them are monitored if necessary. Special requests are no problem. We take extra care to provide for the specific needs of the handicapped or the elderly. 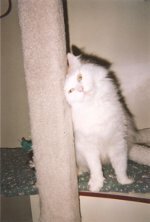 Some elderly cats boarding with us can’t use vertical space as well as a younger kitty, so we have the “Purrsidential Suite”, which has more available floor space, or we can provide special steps to help our guest jump to the first level in the suite. If a guest becomes ill while on vacation, we first attempt to seek the care of his/her own Veterinarian. If this is not possible, medical care will be provided either by Pembroke Animal Hospital or Roberts Animal Hospital, unless an alternative Veterinarian has been specified. The guests’ regular Veterinarian will be contacted as soon as possible. We do require a phone number where you, the legal owners of our guest, can be reached while you’re away. We must be able to contact you in the event of a serious illness. Tim Bissette loves his flea-free vacation! So do his Mom and Dad! In order to maintain a flea-free vacation spot, we ask that you apply “Advantage” or “FrontLine” to your kitty before you arrive. If you’re unable to get that done, just let us know and we can apply an appropriate dose when your favorite feline arrives. This is the only safe, effective way we’ve found of ensuring that fleas stay outside where they belong and if one happens to sneak in, your kitty is already protected.